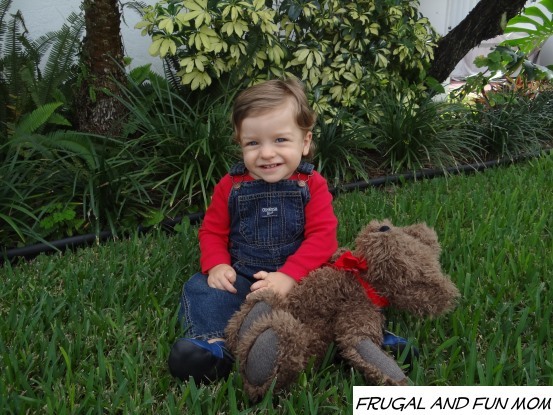 Little Man is so cute in Classic OshKosh B’gosh Overalls! 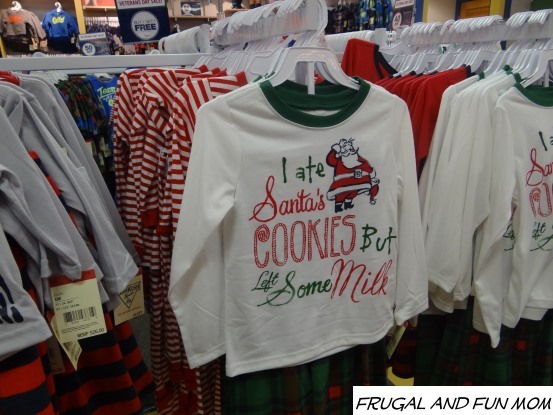 This past week I got an opportunity to shop our local OshKosh B’gosh for Holiday Inspired Outfits. After looking at the displays and checking out the selection in store, the first 2 words that came to mind were ADORABLE and AFFORDABLE! 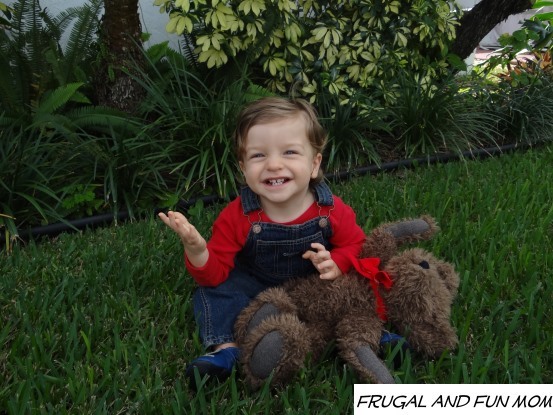 The second word AFFORDABLE actually came as a surprise to me since I always perceived OshKosh B’gosh as being expensive. I felt this way only because the product is so high quality and stands up to the test of time. I even recall an Aunt of mine combing through the Thrift Shops for Osh Kosh products since she knew how well they took wear. Personally I can actually testify to the sturdiness of these products since my kids have worn OshKosh B’gosh. Armed with a 25% off $30 or More OshKosh B’gosh Coupon in hand, I decided my mission would be to purchase all 3 of my kids Holiday outfits. Since the birth of my daughter, I have tried to coordinate outfits for Christmas photos and events, and did not want this year to be any different. I have 3 children whose sizes range from 18 months up to size 8, and OshKosh B’gosh goes all the way up to size 12. Not only did I find cute stuff for my little man, but also found plenty of nice items for his older brother and sister. Not to mention, I located a clearance rack! 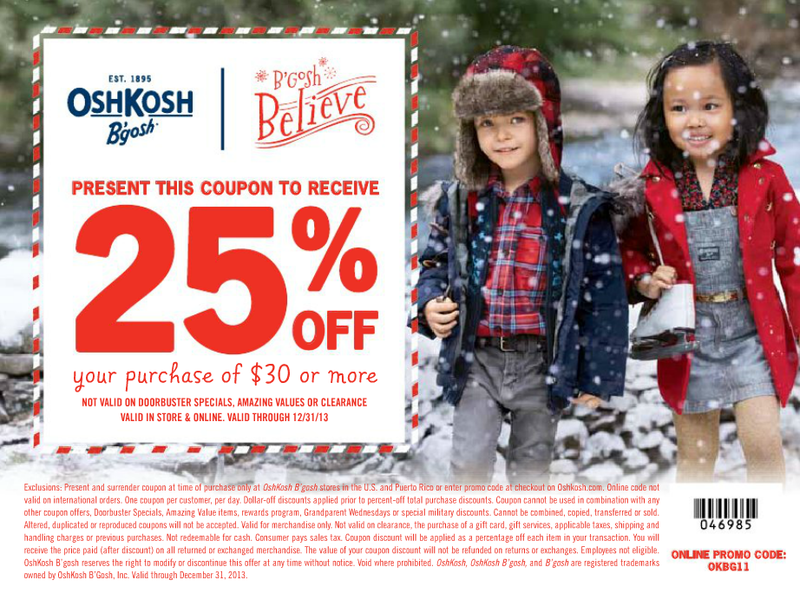 Before you head out to your next OshKosh B’gosh trip, make sure you click to print the coupon above! This code can also be redeemed online at oshkosh.com, and expires on December 31, 2013. The Holiday Plaid Dress that ties all three outfits together. 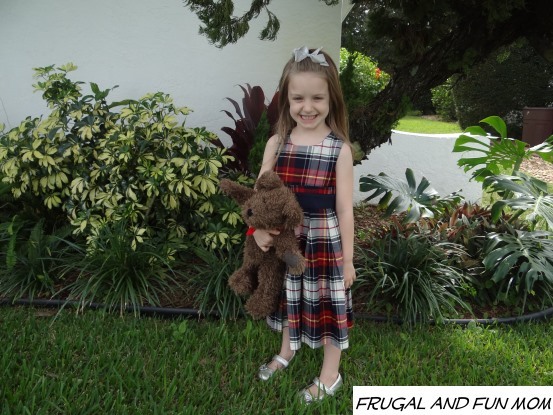 After some searching, I came across a plaid style sleeveless dress for my daughter and decided to use it as my inspiration for the boys outfits. The dress was red, blue, grey, and white. Regular price was $52, but it happened to be on sale for $26.00. The staff was extremely helpful in my mission for Holiday clothes, and one of the store associates actually helped me find coordinating jeans, and a sweater and a pullover so the boys would match. They all looked really good together. Little man modeling one of his OshKosh B’gosh Holiday Inspired Outfits. Since they had so many sales going on in store, I ended up getting 2 outfits for the baby, a jacket, outfit, and dress for my daughter, and an outfit along with an extra pair of jeans for my oldest son. The jeans were on sale for $12, so I grab another pair. Of course I used my coupon, and saved even more through the OshKosh B’gosh Reward Program. 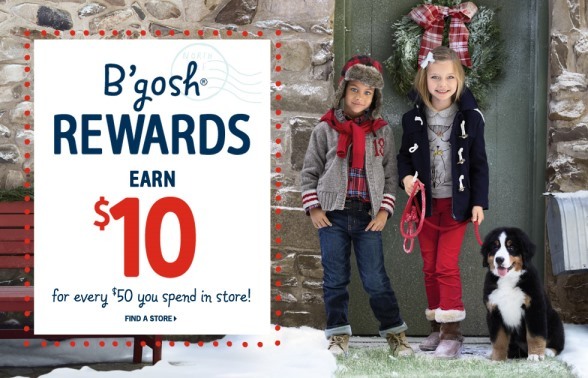 OshKosh B’gosh shoppers get $10 in rewards for every $50 spent, so I got an extra $20 in B’gosh rewards to spend on another shopping trip! I am so happy that I took this trip to OshKosh B’gosh. I had such a pleasant shopping experience, and now I know where I can find affordable jeans and outfits for my kiddos in the future. 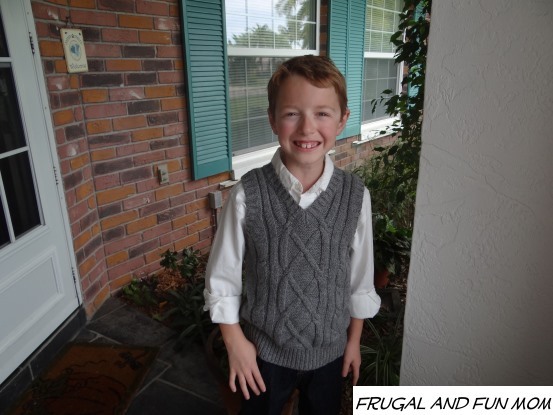 My 7-year-old sporting the Casual Holiday Look. 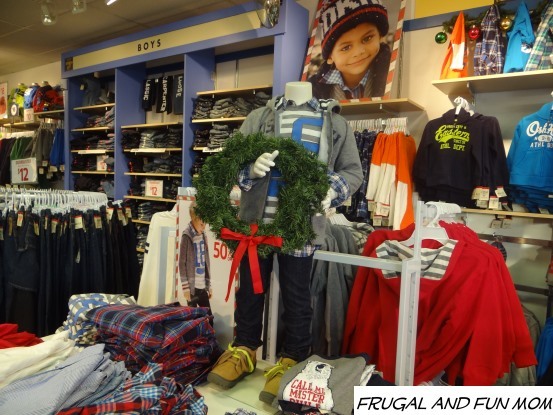 When was the last time you shopped at OshKosh B’gosh? What impressed you most about their clothing and store? To see OshKosh B’gosh clothing selections visit oshkosh.com. 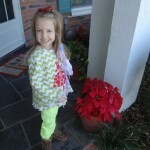 You can also check out their current promotions and latest styles at facebook.com/oshkoshbgosh. I can’t wait to see the Family Christmas Photo this year! Awe - they are adorable! My son had a growth spurt recently, so I need to visit an OshKosh B'gosh! When my kids were younger most of their wardrobe came from Osh Kosh. I loved their clothing. 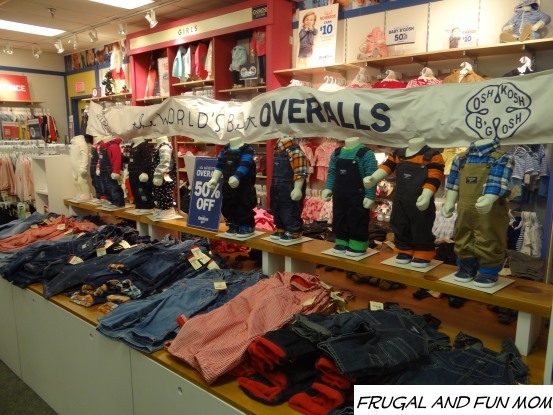 They have the cutest clothes and your kids are just adorable in their new outfits! Those really are some cute styles! I wore OshKosh B'gosh when I was little and my little boy wears this brand too! I LOVE this brand. I used to buy my daughters the overalls when they were young. I wish we had an OshKosh store near us. 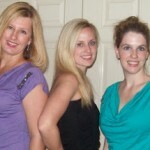 I love to buy up their clothes during online sales, or when I find them at re-sale or thrift stores. We just shopped there the past weekend and walked out with so many great deals! OshKosh B'gosh is one of the brands I dressed my boys in when they were younger. You do pay a bit more but the quality can't be beat. Your little models are adorable! I love their clothing! Sturdy, fashionable, and affordable! Oh my gosh, those pictures are the cutest! I am going to have to check them out for their Christmas styles! I wish my boys still fit into these clothes because they have the best outfits and their prices have always been very reasonable. Your little models are adorable! I love OshKosh clothes because they are so durable. I'm shopping there this weekend and I hope to find cute pictures for our upcoming Christmas card. Oh, they will all look soo cute together! I love overalls on kids!! Love them!! !